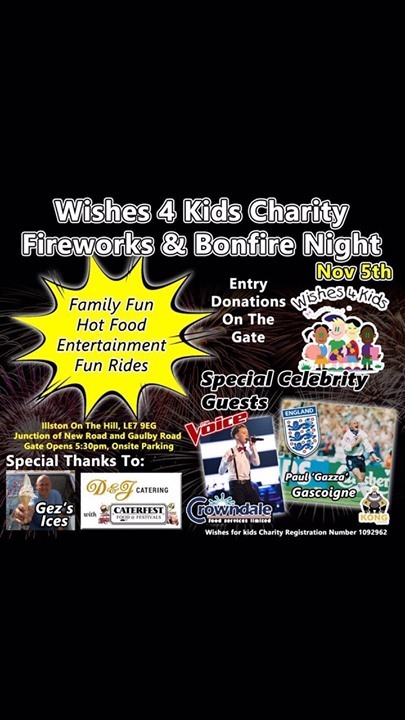 We are very proud to announce that for the 3rd year in a row Wishes 4 Kids have been chosen as the benefitting Charity at the Firework and Bonfire night at Illston on the Hill, on Monday 5th November. A massive thank you must go out to John Greaves, who has given up his land and a huge amount of his time in order to make this happen. Also to our very own Gez Varney who has supported the Charity for 4 years now and has worked tirelessly to help fundraise for Wishes 4 Kids. We are extremely grateful for all that you do. There is no entrance fee, instead we ask for donations on entry at the gate. Lighting our bonfire this year is football legend Paul ‘Gazza’ Gascoigne. There will also be a live performance from Leicester’s own Kade Smith who appeared on BBC’s The Voice. As well as all of that we also have fun rides and entertainment for the whole family to enjoy.